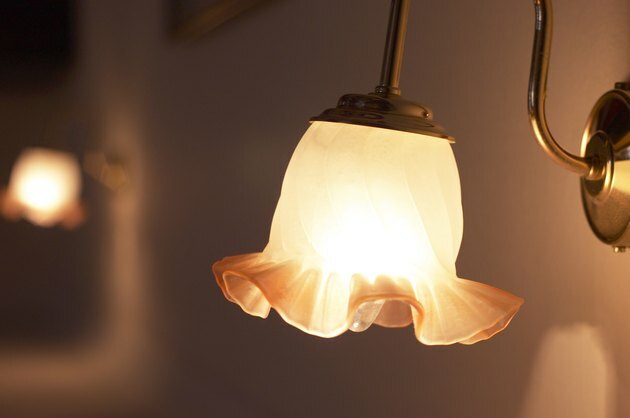 Light globes, like other items in your home, attract dust, dirt and grime. Instead of replacing or tossing the globe, breathe new life into it by painting it with a high-temperature spray paint. Lay three or four sheets of newspaper onto a table, countertop, workbench or other flat surface. Remove the globe from the light fixture and place it on the newspaper-covered surface. Spray the light globe with glass cleaner, inside and outside. Let the cleaner sit on the globe for five minutes. Wear latex gloves to keep your hands from getting wet. Wipe the light globe with a soft cloth or rag to remove any dust and dirt from the globe. If any caked-on dirt is present on the light globe, mix 1 tbsp. of dishwashing soap and 2 cups of warm water in a bucket. Dip a soft cloth or rag into the bucket. Wring out excess mixture and scrub the inside and outside of the light globe. Scrub the grime with light pressure to break up the dirt until it is clean. Rinse the light globe with warm water from a sink. Dry the globe with a dry, soft cloth or rag. Place the light globe upright on the newspaper-covered surface. Place the can of high temperature spray paint 4 inches from the light globe. Spray the globe evenly with the paint. Let the spray paint dry for 10 minutes and check the paint coverage. Apply a second coat of spray paint, if needed. Let the light globe dry completely before placing it back on the light fixture.